This unit tells the story of the first Montessori school, and how it attracted the attention of the world. Over the years Montessori established her reputation as an educator who could accomplish miracles with children who presented special challenges. However, Montessori was becoming increasing interested in apply her educational approach on normal children. The opportunity came to her itself, when she was offered the position to run a day-care center that was being organized for the working class children, who were too young to attend public schools in San Lorenzo, one of the worst slums of Rome. Although many of her colleagues and family members disapproved the idea, Montessori, like always, took on the challenge and grasped the opportunity of working with normal children. Bringing some of the educational materials she had developed at the Orthophrenic School she established the first Montessori school in one large room with one co-worker. The first Montessori school was named CASA DEI BAMBINI (The House of Children) and was inaugurated on Jan 06,1907. Dr. Montessori was intoxicated by the new zest of her life to apply her method on normal children, however, the conditions at the new Casa dei Bambini were horrendous. There was only one untrained teacher to teach her first class which consisted of fifty children, from two through five years of age. It was an extended day school and the children remained at the center from morning till evening while their parents worked. The children were also given two meals per day, bathed regularly, and given a program of medical care. The children themselves were the products of extreme inner-city poverty conditions and ignorance of the parents. Almost all of them came to Children’s House on the first day crying and reluctantly. Most of them were aggressive, impatient and cranky. At this stage, Montessori did not know if her experiment would work under such conditions. However, she, not caring about the odds, began by teaching the older children how to help out with the everyday tasks that needed to be done. She also introduced the hand-on materials of perceptual discrimination and puzzles and eye-hand manipulative exercises that she had used with mentally disabled children. Montessori must have had some hope of success but the results surprised her. The materials seemed to be working miraculously. Unlike her mentally challenged children who had to be pushed to use her apparatus, the normal children were naturally attracted to the work she introduced. The aimless street wanderers began to settle down. They began to show longer and longer periods of constructive activity. They were fascinated with the puzzles and perceptual training devices. Montessori introduced exercises of practical day to day living like cleaning, dressing, gardening, etc. and to her amazement, children aging three and four years took the greatest delight in learning practical everyday living skills. She noticed that such activities made them more independent and added to their self-respect. Their interest was developing day by day and they progressed so rapidly that each day they pleaded Maria to show them more. The older children began to take care of the school. They also assisted their teachers with the preparation and serving of meals and the maintenance of a spotless environment. The discipline problems vanished dramatically. The children running wild in the street had turned to models of grace and courtesy in just a short span of time. Montessori, when criticized of her method being too structured and academically demanding of young children, laughed out saying, “I followed these children, studying them, studied them closely, and they taught me how to teach them.” Talking about the role of the teacher, she argued that the educator’s job is to serve the child, determining what each student needs to make the greatest progress. She believed that children follow their inner strong urges to select their activities and work. These urges are universally similar in all children and are the product of millions of years of evolution. Nature, itself encourages children to select the activities, which are appropriate for development at that stage. To her, a child who fails in school should not be blamed, any more than a doctor should blame a patient who does not get well fast enough. Just as it is the job of the physician to help people find the way to cure themselves, it is the educator’s job to facilitate the natural process of learning. Montessori’s children showed tremendous progress into academics and each achievement was like a sudden explosion. The children were too young to be sent to public schools, yet they literally begged to be taught how to read and write. They learned to do so quickly and enthusiastically, using special manipulative materials. Montessori just kept on noticing the inclinations of the children and developed manipulatives accordingly. The other area, which fascinated the children, was numbers. To respond to their interest, the mathematically inclined doctor developed a series of concrete math learning materials. These materials are so comprehensive and yet concrete in nature that they still fascinate many mathematicians and educators to this day. It did not take those three, four and five years old long to start adding and subtracting four-digit numbers. They further progressed on to multiplication, division, skip counting, and increasingly advanced and abstract concepts. Montessori discovered an unlimited potential in children to learn. They began to show interests in other areas as well. This compelled the already overworked doctor to spend night after night designing new materials to keep pace with the children in geometry, geography, history, and natural science. 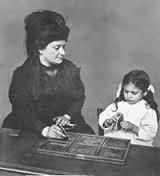 Montessori discovered that her children showed more interest in academic manipulatives rather than toys. She made this discovery shortly after her first school opened, when a group of well-intentioned women gave the children a collection of lovely and expensive toys. The children took profound interest in those new gifts for a few days, but they soon returned to their learning materials. She also found that children generally preferred work over play, at least during the school day. Montessori method wasn’t so perfect since day one. She improved it through trial and error. She continued to observe the children deeply, made educated guesses and finally experimented. For example, one day the teacher arrived late at the center. The children, meanwhile, had crept in through the window and started their work. They even took the material themselves from the cupboard, which normally used to be locked, but was open just by chance. She, instantly, recognized that the children were capable of selecting their own work, and removed the cabinet and replaced it with low open shelves on which the activities were always available to the children. This seems to be a small change, but it actually was against all the educational theories and practices of that time. In order to convey her method to more and more people Montessori also started teachers trainings program. She conducted her first teacher-training course in 1909. Infused with the zest of spreading her method, she left the original Casa dei Bambini in 1911 and spent most of her time in making new schools and conducting teachers training programs. She travelled to places all over the world to conducted teachers training programs, give talks and set up new schools. Maria Montessori’s first Casa dei Bambini became famous in the entire world in a very short span of time. Thousands of visitors went away amazed and enthusiastic. After the success of her first school, she started the second one and then the third and so on. Her system worked everywhere in so many different settings. Montessori became the interest of leaders and scientists around the world. Even, in America, figures like as Woodrow Wilson, Alexander Graham Bell, Thomas Edison, and Henry Ford supported and praised her work. Numerous publication and articles written about and by Montessori, made her a well-known personality to parents and teachers. The most incredible thing about Montessori method is that her model center (Casa dei Bambini) got duplicated everywhere, which is a rare attribute, as in this field many others had promoted opinions, philosophies, and models that have not been readily duplicated. The Montessori method is one of the most systematic system of education that gets applied very well to new settings. In the first thirty years of the twentieth century, the Montessori Method seemed to offer something for everyone. For instance, scholars from conservative school of thought valued the calm, responsible behavior of the little children, along with their love for work. People with liberal approach highly praised the freedom and spontaneity. Many political leaders and educationists saw it as a way to reform the old-fashioned school systems of Europe, North America, and Asia, as well as an approach that they hoped would lead to a more hardworking, peace loving and disciplined population. Scientists of all disciplines praised Maria’s objectivity and the experimental foundation of this method. At one time the wave of support and enthusiastic praise for Maria was so high that many began to anticipate a dramatic change in the face of education, which unfortunately did not happen that fast. During 1920s and 1930s Montessori focused more on how her method would work with older children aging 6 to 12 years and 12 to 18 years. Many Montessori elementary and secondary schools started working in different parts of the world. The impact of two world wars also made her focus her attention on developing ideas about integrating Cosmic and Peace Education in Montessori elementary curriculum in particular. She and her followers all over the world began to believe that her system of education would lead to complete human regeneration. Montitute LLC, USA. All rights reserved.